Starting synchro coaching can be daunting but it is very rewarding. 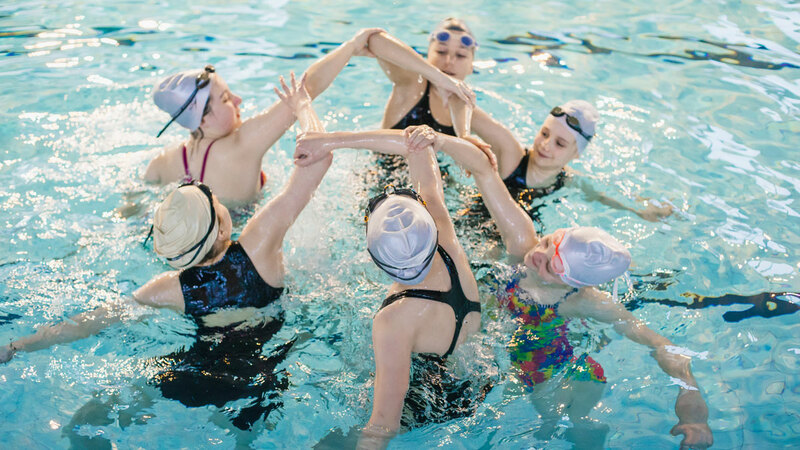 The simplest and best way to get involved is by volunteering as a synchro coach at your local club. The head coach and existing volunteers at the club will help you along the way. But for those just starting out, here are some top tips to help you through those first months. You may be thinking “I am just starting out, I don’t know much about synchro” and that is fine! Which days/sessions do you want to help out with? Is there an age range/ability group that you want to work with? What sort of session are you more interested in – figures, routines, land, stamina, everything? Are you hoping to become a qualified coach or judge in the future? If you are unsure who you would like to work with then try to watch some sessions to get ideas of how they run and see what you think. Once you have an idea of those points, it’s time to make contact with someone from the club. Many clubs have a volunteer coordinator so they are a good point of contact. If you are unsure who to turn to then the club secretary should be able to direct you to the right person. There are certain requirements that need to be met when people are volunteering so don’t be surprised if you are asked to fill in some paperwork or become a formal member of the club. It is useful if you can prepare a bit yourself before you start. Do you have suitable clothing? These are footwear for poolside and appropriate clothes. If you have decided on a group which are working towards a grade then print out that grade and read it through. It doesn’t matter if you don’t understand it right now. Just having it with you means you can look through it when you need it. Introduce yourself to other coaches and explain you are looking at getting into coaching. You may wish to have a chat with one coach in particular if you have chosen a particular group you wish to work with. Before you take any groups on your own, you should gain some experience by shadowing a current coach. To start off with this involves literally just standing or sitting with a coach when they work with a group and listening to what they are saying. Once you feel confident, ask the coach questions about what they are doing and why they are giving that feedback to the swimmers. Most coaches are happy to help people learn and you can gain a lot from this. You may even start to see faults in skills and be able to give some basic corrections. When you feel ready, it is important to get qualified. A qualification will allow you to get accreditation at competitions and also cover you under the clubs insurance policy. Currently for synchro there are two levels of qualification: assistant coach and coach. Many volunteers are happy just with the assistant coach qualification but some do progress further. It’s worth asking your club if there is financial help towards the cost of the course as there are pots of money available. This is the final step of the process where you work with your own group of swimmers. There should be a senior coach directing the programme but there will usually be some flexibility for you to tailor parts of sessions.